Achieve surfer-inspired locks with the Alterna Bamboo Beach Ocean Waves Tousled Texture Spray; a lightweight, non-greasy spray that infuses sun-parched hair with intense moisture and vibrancy. Fortified with Tahitian Coconut and Organic Bamboo Extract, the texturising spray delivers long-lasting hydration, whilst providing UVA/UVB protection and defending against the damaging effects of the sun, pool and saltwater. 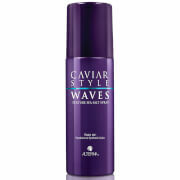 Ideal for use on damp or dry hair, you can expect voluminous, luscious locks with an exotic Mango and Coconut scent. On damp hair: Spray from roots to ends and twirl or "scrunch" hair and diffuse or air dry. On dry hair: Spray from roots to ends and scrunch as it dries. TIP: After spraying throughout damp or dry hair, braid sections of hair and air dry/blow dry to enhance the wavy texture. Water (Aqua), Sodium Polystyrene Sulfonate, Sorbitol, PPG-5-Ceteth-20, Panthenol, Superoxide Dismutase, Phospholipids, Helianthus Annuus (Sunflower) Seed Oil, Polysilicone-15, Bambusa Vulgaris Extract, Sea Salt (Maris Sal), Algae Extract, Aleurites Moluccana Seed Oil, Cocos Nucifera (Coconut) Oil, Gardenia Tahitensis Flower Extract, Saccharomyces/Magnesium Ferment, Saccharomyces/Copper Ferment, Saccharomyces/Silicon Ferment, Saccharomyces/Zinc Ferment, Saccharomyces/Iron Ferment, Glycerin, Quaternium-95, Propanediol, Butylene Glycol, Lactic Acid, Phenoxyethanol, Ethylhexylglycerin, Fragrance (Parfum), Benzyl Benzoate, Limonene. (20-14-1214A).